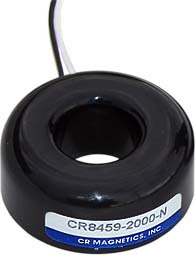 The CS10 uses CR Magnetic's CR8459 Current Transformer to measure the approximate current over a range of 0 to 200 Amps. The CS10 outputs a millivolt signal allowing the transducer to be directly connected to a datalogger. The CS10-L is intended for lower-accuracy applications such as motor or generator load conditions, efficiency studies, intermittent fault detection, and rough submetering.